Do you have a favorite magazine? Can you name just one? It’s hard, I know. If you’re a big magazine reader like me, you have a couple favorites. Sure, that list of favorites may change over time, especially lately since more good magazines are discontinuing publication (such as Adorn, Blueprint, Cottage Living, Country Home, and Domino). But try to narrow your favorite down to just one. 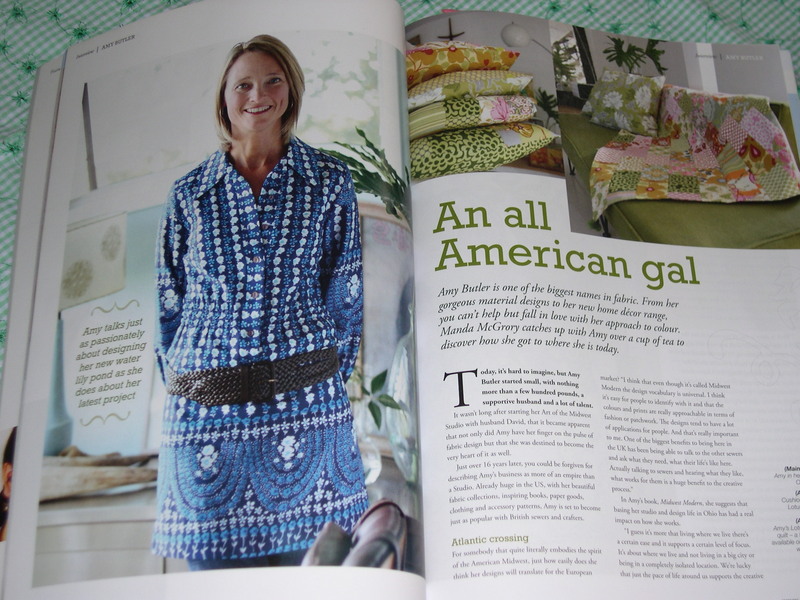 I am so excited about my latest favorite magazine that I wanted to share it with you. 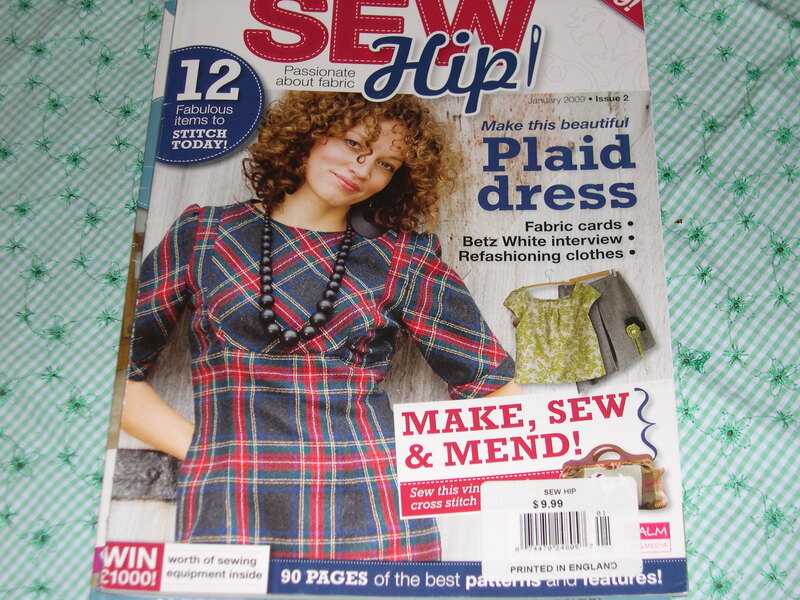 Sew Hip magazine, published in the U.K., began with it’s premier issue in December 2008. It comes out monthly so I have been buying it at the bookstore but I decided I love it so much I ordered a subscription. My March issue just came yesterday, so I need to find the February issue when it’s on the magazine shelves. 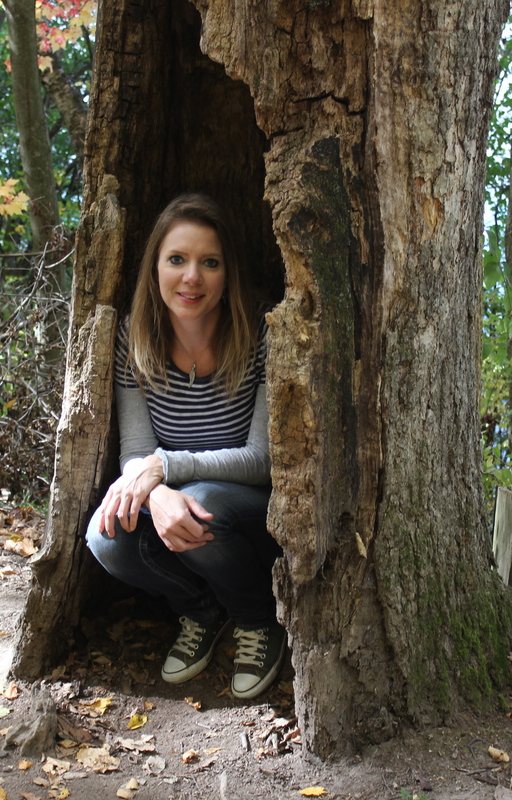 … and Alicia Paulson of Posey Gets Cozy. 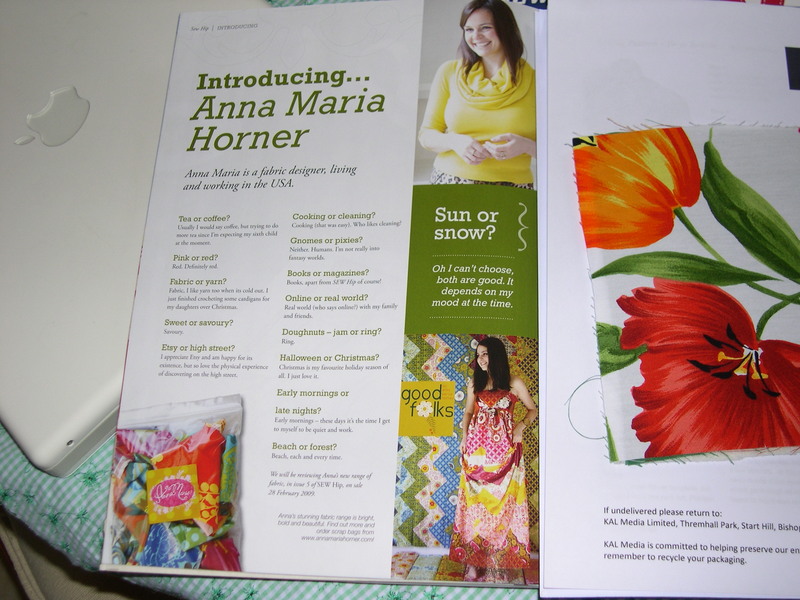 There are also wonderful patterns, such as this charm quilt pattern that I’m going to make with my Darla fabrics. 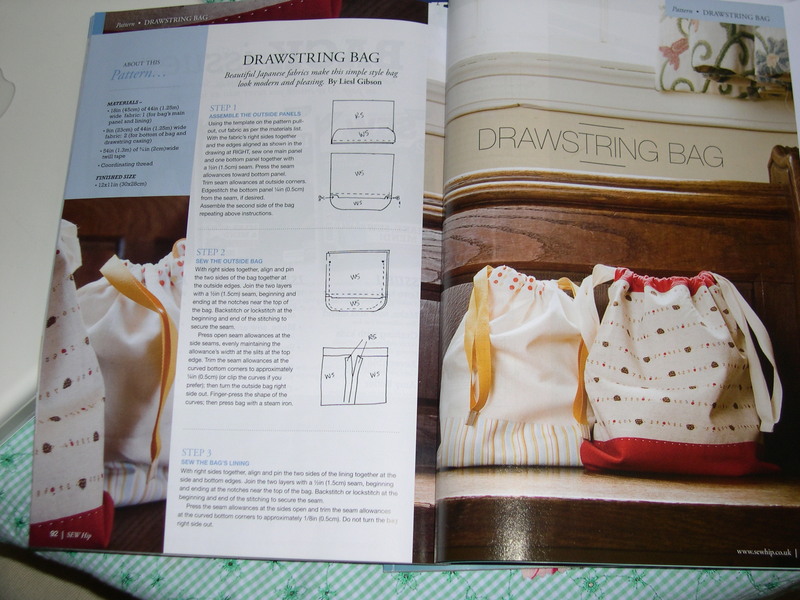 They have regular columns each month, including Book Reviews, Pattern Reviews, Sewing News, Things We Love, and so much more. 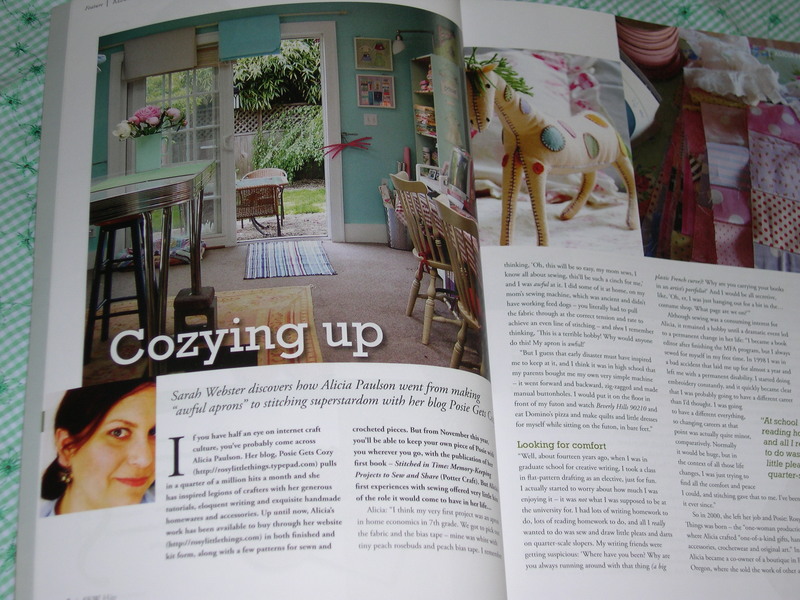 The January 09 issue had an interview with Betz White, who is originally from the town I live in so naturally I love to follow her success. Here is the February 09 cover – isn’t that pretty and inviting and inspiring?! 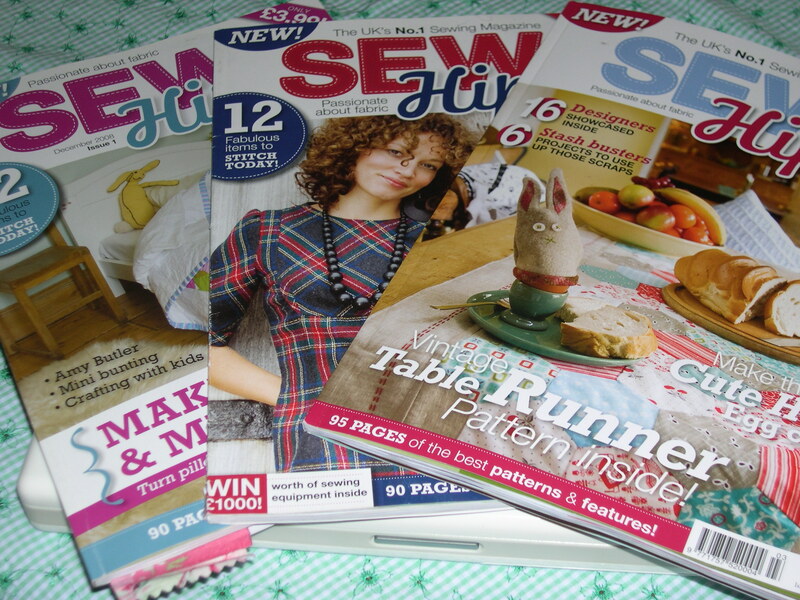 This March 09 issue has SO many wonderful things in it – from an article reviewing several sewing reference books, to patterns for a skirt, an apron, an egg cozy, a yo-yo quilt, a child’s toy, craft activities for kids, an interview with the founders of Spoonflower, and an interview with Liesl Gibson, creator of Oliver + S. All things that I love! 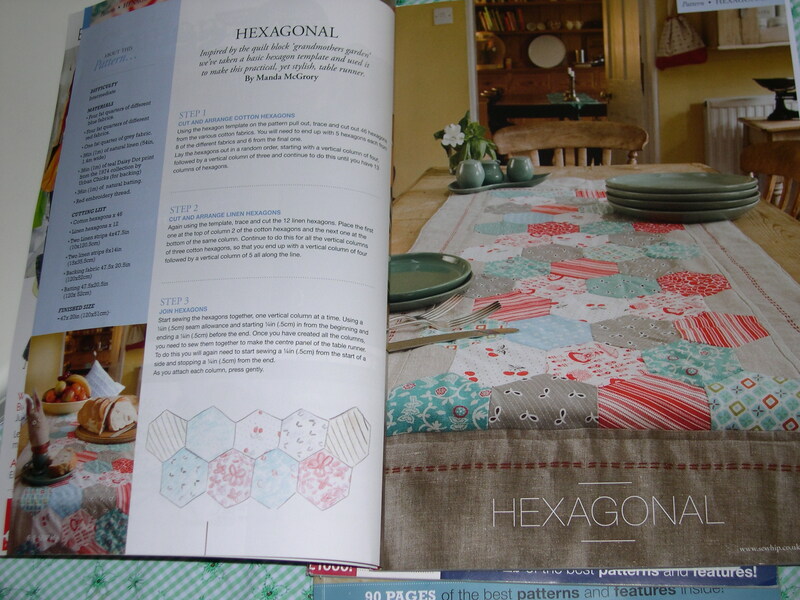 I really want to make that hexagon table runner featured on the cover. 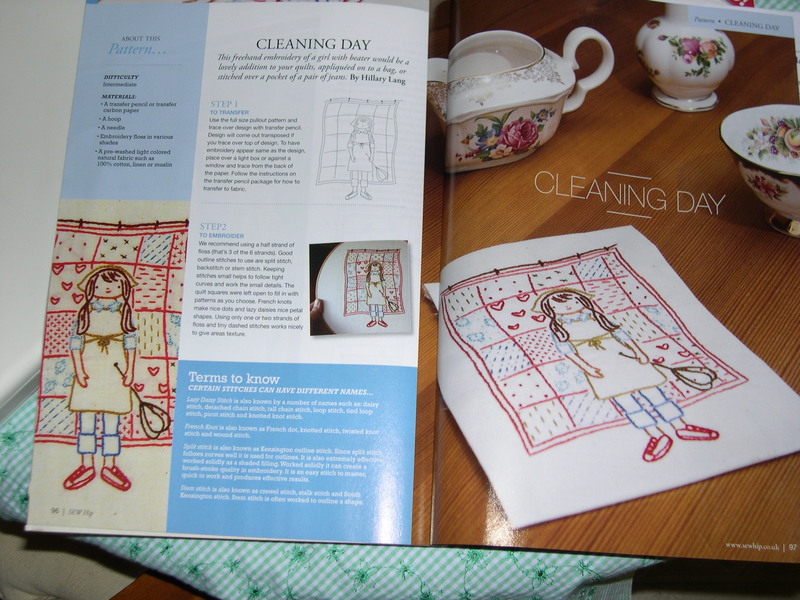 … and this adorable embroidery project, designed by Hilary Lang, which is perfect for someone I know who loves to take the rug from her apartment outside and beat it with her rug beater. I want this magazine to succeed more than any I have ever read. Pick up an issue next time you’re at the bookstore, or better yet, order your very own subscription! By the way, I’m curious, what is your favorite magazine? My favorite magazine is still the New Yorker. I read every one cover to cover since early in my college career. Lately they’ve been sitting on the shelf a bit too long – motherhood and work get in the way of lounging in a chair curled up with one. They have just started selling Sew Hip in Australia – yay! The magazine looks cool – I’d probably want to see a couple of issues before actually subscribing & I’m not sure if I’ll be able to do that in the US or not, but I’ll definitely keep my eyes open! Thanks! Come by if you would like to play, but of course it’s completely optional. I haven’t seen a Sew Hip yet. Sew Simple though is starting to grow on me. Thanks so much for the heads up for this magazine! I’ll definitely be looking for this one. I’m so sad, too, about all of the mags that are closing down. I also heard that the Mary E. mag is closing down too. Hope this new mag makes it! 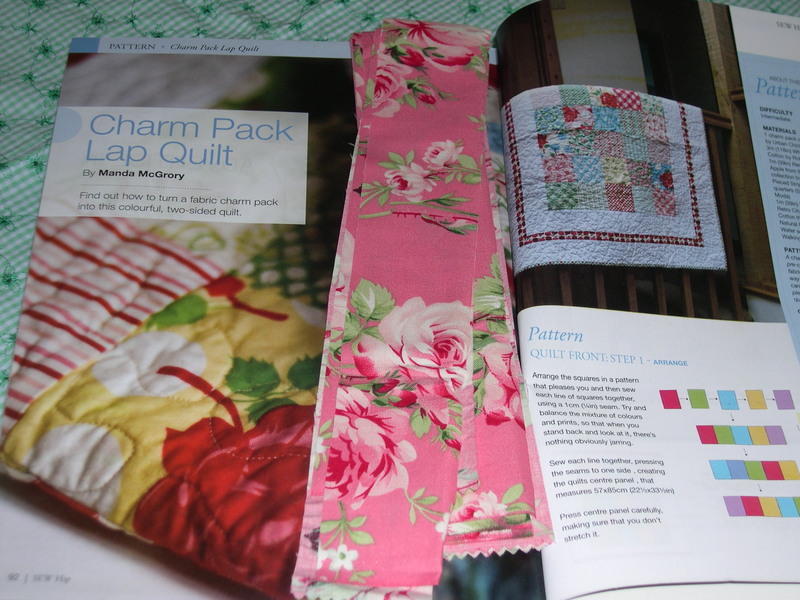 I love Quilts N’ More, and the Australian Patchwork & Quilting, Stitch (even though I’ve only seen the one issue!) I’m wanting this one, though–did you buy it on the newstand? Does Barnes & Noble carry it, do you know? This looks like a really great mag! 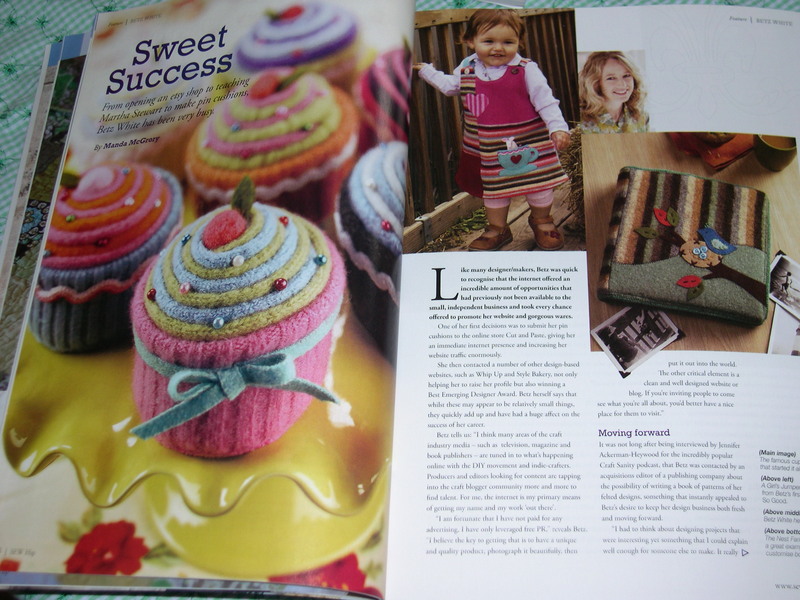 I’m really liking the Sew Hip magazine too (just as well as I’ve been lucky enough to have a project accepted for Issue 6). 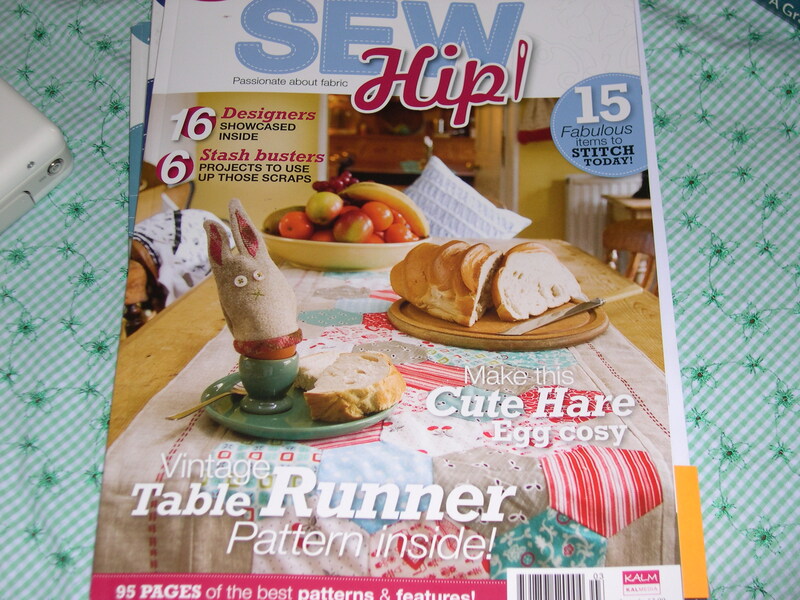 I thought Issue 5 was the best yet – can’t wait to see the next installment of the Sew Hip mystery quilt instructions!